Bem Brasil, a frozen pre-cooked french fries producer, has built an 82' high automated rack-supported warehouse with a capacity for more than 33,000 pallets. 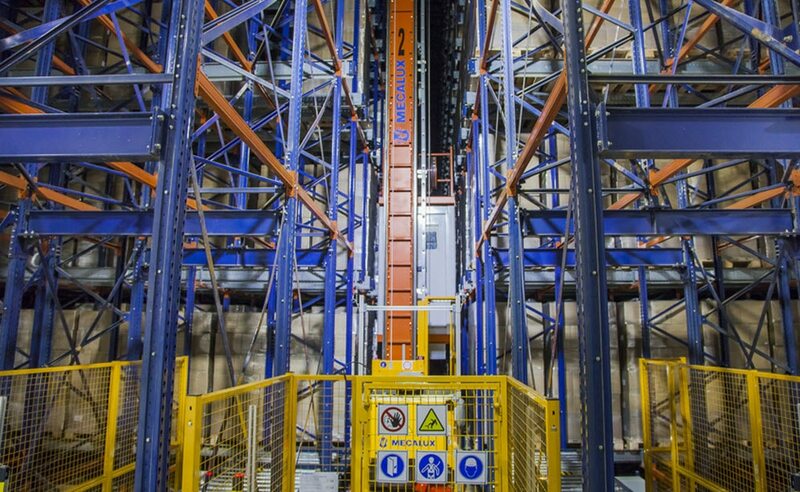 This intelligent warehouse is fitted out with an AS/RS for stacker cranes that uses the Pallet Shuttle system. Apart from that, the Mecalux Easy WMS was implemented, the warehouse management system whose mission is to control the in-house operations and processes with efficiency. Founded in 2006 in the city of Araxá, Bem Brasil is a company that produces more than 112,000 tons of pre-fried frozen french fries a year. Currently, it has become the national leader in the sector and one of the most popular brands in Brazil, and a household staple. In 2017, Bem Brasil opened a new plant in the town of Perdizes (just 31 miles from Araxá), located strategically to expedite the distribution of its products throughout the entire country. The frozen fries company wanted to boost its growth rate from the last few years and to expand into international markets. Lately, the group’s business strategy was based on vigorously updating product sales and, recently, it has also modernized its packaging. Bem Brasil required an intelligent warehouse to house both raw materials used in production processes and the finished products ready to be shipped out. The installation had to provide the maximum potential storage capacity to accommodate all these SKUs, as well as to streamline inflowing and outflowing goods. In addition, to ensure optimal preservation of the goods, the frozen storage installation needs to run at a constant -22 ºF. The business approached Mecalux to get it to collaborate in the design, building and rollout of this new frozen goods warehouse. The result is a more than 82' high automated clad-rack warehouse with the automatic Pallet Shuttle system that provides a storage capacity of above 33,000 pallets. Rack-supported warehouses are buildings formed by racks that support their own weight, of the stored goods, as well as of the lateral and roof cladding. During the design phase, one must take into account factors that interact with the structure, such as the force of the wind, the seismicity corresponding to the installation’s zone and the local regulations in force. This type of construction is widely used in frozen storage chambers since it only takes up the space that is strictly necessary, which pays off in terms of lower power costs to keep the installation at sub-zero temperatures. The structure is assembled on top of a heavy-duty concrete slab that insolates the floor and sides of the building. The automatic PS system was set up and run by stacker cranes in a chamber made up of three, 469’ long aisles and a block of racks on each side that hold between eight and sixteen pallets deep. Overall, the storage capacity reaches a total of 33,696 pallets of 39" x 48" with a 1.23 ton max weight each. The Pallet Shuttle is a high-density system suited to consumer products and a large volume of pallets per SKU. The model installed in the Bem Brasil warehouse is fully automated: three stacker cranes (one per aisle) transport the merchandise between the input and output positions of the warehouse up to any storage channel. Inside the channels, the automatic shuttles execute the workflow movements with the goods automatically, shifting the pallets to the first open spot. To draw out the goods that must be sent from the warehouse, the Pallet Shuttles collect the pallets, send them to the end of the channel and insert them into the stacker crane’s cradle. The Pallet Shuttle in the stacker crane’s cradle waits for the pallet’s arrival from the checkpoint. The stacker crane scoops up the pallet with several chains installed in the cradle and moves to the channel assigned by the WMS. The automatic shuttle raises the load slightly and slots it into the storage channel. It slides with the pallet to the first open location and, once there, lowers the pallet, setting it on top of the rail. The stacker crane waits for the Pallet Shuttle to finish and move automatically back onto the cradle. Less is more at this center’s operations: the receipt and dispatch of goods take place at one end of the warehouse via a circuit of chain and roller conveyors that organize pallet flows. Goods flowing from the production center Operators place empty octa bins (large cardboard or plastic bulk containers) under a hopper so that they fill with product. Then, a hydraulic lift table raises the load to the height of the inbound conveyor. Goods flowing into the production center from outside. It is set up right next to the preloading area, while both areas are separated to stop the interposition of the two operations. No matter where the goods flow from, the pallets must pass through the checkpoint, which verifies they are in good condition and their weight and measurements correspond to the quality requirements in the automated warehouse. The warehouse has a huge staging area with twenty flow channels that are each seven pallets deep, supplied by a transfer car. This zone is set apart from the AS/RS via vertical doors to stop cold loss. Roller channels are slightly inclined so that pallets slide via gravity from the highest to the lowest point, which faces the docks. The rollers have a split setup at the exit point, meaning pallet jacks can slip their forks in to extract the pallets. The Easy WMS warehouse management system by Interlake Mecalux is tasked with coordinating and spearheading all in-warehouse operations, as well as ensuring everything is running smoothly. Among its primary functions are the receipt, location allotment and storage of pallets as per their start point and turnover, or the extraction and the end shipping destination. Moreover, given that this is a fully-automated warehouse, the Galileo control module is implemented, which sends movement orders to the various devices within the installation (conveyors, stacker cranes and Pallet Shuttles). Max storage, max pallets: the Bem Brasil center can house more than 33,000 pallets of 39" x 48" that can each weigh 1.23 tons. Productivity never better: the AS/RS warehouse ensures a smooth flow of goods with operators hardly having to step in, eliminating any potential error. Good management: all operations are governed by the Mecalux WMS and the Galileo control module. This gives movement commands to the electromechanical devices that comprise the installation.